"Battle Isn’t Yours –– But God’s"
Welcome to "Battle Isn’t Yours –– But God’s"
When we are learning to seek the Lord God, and waiting on Him, He will answer. When, Judah was assembled before the Lord, Jahaziel began to give a prophesy and speak God’s direction to them. Everyone was waiting on God to answer. While learning to seek the Lord, His answer may be a plain and simple one, as Judah’s was. The Lord had told Judah not to be afraid, because the battle was not theirs, but His. God, did not say there was nothing for them to do in the battle. He was telling them, He was going to show them their part. 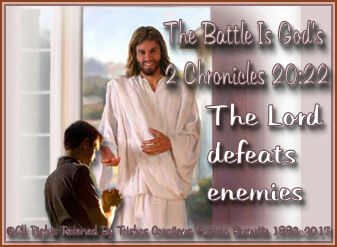 Which was strength and wisdom in the Lord, but the battle was still His own to win. After God gave, them that word of encouragement, He gave them a word of specific instruction. We are to wait on God, till He tells us what to do, and do it in the strength He gives us –– while waiting on Him. We are to in Him and trust in Him. Let God win your Battles!! !